I’ve just applied to extend my Visa here in Armenia. This is perfect if you want to stay a few days past your official Visa exit date. For staying much longer or for getting a multiple entry visa the process is probably similar, though I don’t have direct experience with that. While the Visa extension process is fairly painless – easy and inexpensive – you do have to wait a few days. But it still may be a little intimidating for some so I’ll write this as a step-by-step guide for those who are researching how to do it. For the impatient among us, here’s a bullet-point summary. Allow up to one week for processing. Budget 500 dram per day, plus 10-15% extra. Go to the Passport and Visa Department, room 212. Fill out the right forms, make copies of your passport and visa and deposit money in the right account. Bring all documents back to room 212 for their approval. Bring all documents to room 214. Return when they tell you. First, make sure you’ve got a few days left on your Visa to begin with. My process will take 3 days, but I would guess that this could take up to a week depending on holidays and weekends. So as soon as you know you’ll need to extend it, start the process. You’ll also need to budget 500 dram for each day you want to stay, plus another say 10-15% for miscellaneous expenses. All together my 5 day extension cost just 2,840 dram, or the equivalent of $7. So it’s more expensive per day than getting a longer visa at the border but can be well worth it. In my case the extension saved me hundreds of dollars on airfare. To apply you’ll need to go in person to the Passport and Visa Department, located at 13A Mesrop Mashtots Ave. The building is located in the courtyard behind the Artist’s House, which seems to be dedicated to performance music like opera and orchestra. You can enter through the alley just to the left side, when facing that building. Or you can enter through an alley just off of Mashtots on Amiryan St. The walls of this alley are painted with stylized versions of passports, travel documents and official looking stamps. The building itself is up a set of white steps with glass doors. The office is closed between 1-2pm. The left side shows the location of the Passport and Visa Department. The right side shows the alley into the courtyard from Amiryan St.
Once you enter you’ll go upstairs and to the left, to room 212. Explain what you want to do and they will give you a form to fill in as well as a bank account number to deposit the funds. You’ll also need to make a copy of your passport’s face page and your current Armenian Visa. 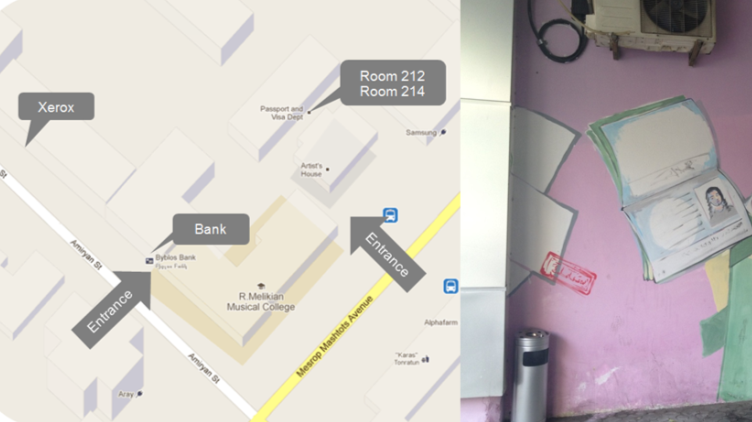 There are facilities close by to take care of this, see the map below for details. At the bank you’ll likely pay somewhere around a 10-15% transaction fee. To make copies it should be less than 100 dram. Next you’ll return to the Passport and Visa Department, again to room 212. They will initial your form, tell you when to return and instruct you to take the paperwork to room 214. There you will drop off the paperwork (you keep your passport) and send you on your way. Go back to their offices when they tell you. Go again to room 212 and tell them that you submitted your paperwork a few days before. They’ll look through a big stack of papers, find yours, take your passport and ask you to wait. 10 or 15 minutes later they’ll get the proper stamps and signatures and return your passport. Easy as can be! Posted on September 19, 2012, in Armenia, Living in Armenia and tagged Armenia, armenia visa extension, extension, passport, passport and visa department, travel, visa, visa extension, Yerevan. Bookmark the permalink. 3 Comments. Thanks a lot for the information. Just want to know when was it written, I mean the year? sorry, I now could see that it was posted on Sept 2012. This place is transferd somewhere else.if you want to go there just tell to taxi driver that take you to ovir. There you should go to second floor.there is one glasses room .there you should ask your request.for each day you have to pay 500 RMD .you will get it in less than 1 hr.